The BBC will bring audiences comprehensive coverage of this year’s Summer Olympics with more than 3,000 hours of live sporting action from Rio 2016. BBC Four takes over as the secondary Olympics channel; together with BBC One, 550 hours of 'traditional, linear TV' coverage will be shown. 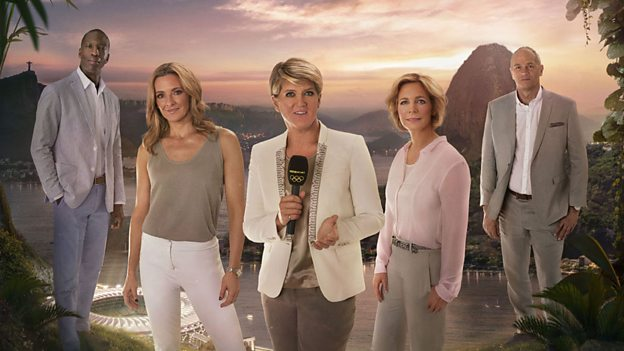 Hazel Irvine, Mark Chapman, Clare Balding and Jason Mohammad will be at the helm of BBC One’s coverage, which kicks off with the much-anticipated Opening Ceremony on 5 August. They will steer audiences through the live action each day from 13:00 to 04:00 until the Closing Ceremony on 21 August. Over on BBC Four, Dan Walker and Ore Oduba will present the live action daily from 13:00 to 04:00. Throughout the duration of the Games the BBC Breakfast sofa will be moved into the home of BBC Sport, with extended highlights of the events in Rio from 6am. BBC Two will air a replay of key Olympic events from 9:15am every morning. The presenter line-up across radio and TV also includes Sir Steve Redgrave, Sir Chris Hoy, Michael Johnson, Denise Lewis, Sir Clive Woodward, Victoria Pendleton, Beth Tweddle, Rebecca Adlington and Darren Campbell. Fresh from his IBF world heavyweight title win, boxing champion Anthony Joshua will also join the BBC team out in Rio this year. Up to eight Red Button streams carrying coverage from Rio 2016 will be available: the availability of these streams will vary from platform to platform due to capacity reasons. Further details are to be confirmed. Satellite viewers are guaranteed to get the full set of Red Button services. 24 HD streams carrying extra coverage from Rio will be available, but unlike London 2012, these streams will be delivered online only. Viewers will be able to access these streams on "normal TV sets" via connected TV apps, such as the BBC Sport App, also available via smart boxes and dongles, such as Roku and Amazon Fire TV, or via the BBC Red Button+ service on compatible smart TVs and platforms such as Freesat Freetime and YouView (BT TV/ TalkTalk TV/ Plusnet TV). On Radio 5 live, presenters Eleanor Oldroyd, Mark Chapman, Mark Pougatch, Russell Fuller, Caroline Barker and former Olympic Champion Jonathan Edwards will lead listeners through all the drama from Rio. Starting at noon every day, the station will bring live action, latest news and all the magical moments of the 2016 Games. Beginning 7 September, Radio 5 live and Radio 5 live sports extra will also have over 80 hours of live coverage of the 2016 Paralympics with a team including Baroness Tanni Grey-Thompson, Gigi Salmon, Jonathan Overend, London 2012 gold-medal-winning cyclist Mark Colbourne, and swimmer Graham Edmunds. Paralympic TV coverage is on Channel 4. Alongside the latest news and live pages, the BBC Sport website will also have highlights and replays. The Olympics Playlist, a downloadable catch-up programme will also be available to view every morning on BBC iPlayer. On the iPlayer radio app, fans will be able to listen again to 5 live’s Olympic Breakfast 30-minute round-up, which will be available as a DRM download. CBBC HD and CBeebies HD will have "reduced coverage" according to the BBC. Services continue as normal in standard definition. Users are advised to check series links set for CBBC HD and CBeebies HD will not record, to see if these need resetting to the SD versions of the channels. BBC Parliament will not be available during the Olympics. This coincides with parliamentary recess. Beginning 7 September, Radio 5 live and Radio 5 live sports extra will also have over 80 hours of live coverage of the 2016 Paralympics with a team including Baroness Tanni Grey-Thompson, Gigi Salmon, Jonathan Overend, London 2012 gold-medal-winning cyclist Mark Colbourne, and swimmer Graham Edmunds. The BBC's promotional campaign for the 2016 Olympics will feature an animation which will "transpose the human world of sport to the animal world". The animation will show a world of stunning forest stadiums, inspired by Rio’s Tijuca Forest, while the skills and strength of the athletes will be brought to life by Brazilian animals. The trail makes its TV debut on 10 July during the Euro 2016 final on BBC One.